Posted by Un po' di pepe in Art projects, Mangiamo! The last few weeks, my kitchen table has been a multipurpose space, doubling as a greenhouse and an art studio. For the 4th year in a row, I am participating in the ‘Leftovers’ printmaking exchange. The idea is to use leftover paper and other materials to make an edition of small prints. I need to send 15 hand pulled prints via Wingtip Press to the Idaho Hunger Relief Task Force in Boise. 1 print will be reserved for silent auction to support hunger relief and 2 will be part of travelling exhibitions. Last year, my print went on a Grand Tour to China, Wales, Whangarei New Zealand, Reno Nevada and Boise! The remaining 12 prints are exchanged with other participating printmakers. In a few months, I will receive my ‘leftovers’ package in the mail with 12 prints from around the world! 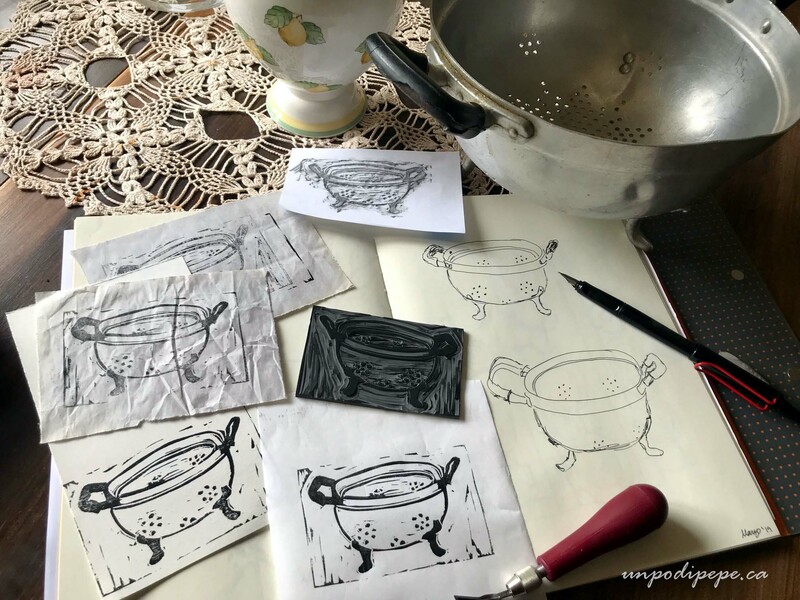 I have a beautiful old aluminum scolapasta (colander) in my kitchen that just oozes character. I worked on my sketches and carved the linoleum here, but will do the printmaking in my little studio space. I have to post the prints by April 10th! Papà has pomodoro seedlings growing on my back porch. They are covered in plastic as it has been sunny, but cold. 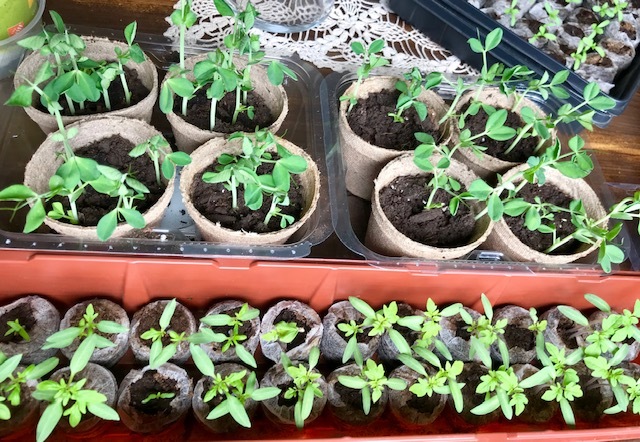 I was given more seeds by a friend, so 2 weeks ago, right after la luna piena –the full moon, I started growing them at the end of the kitchen table by the big window. Piselli and pepperoncini are growing nicely too! 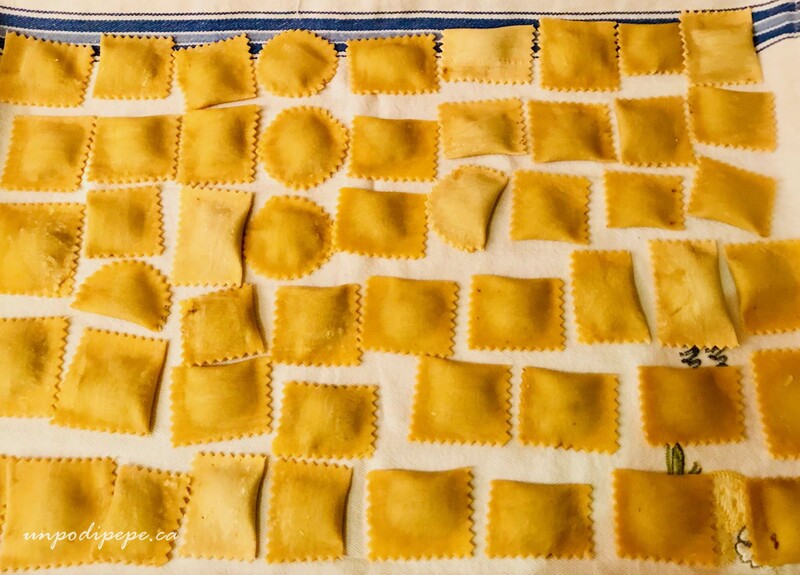 I made ravioli with funghi-mushroom filling but I could not seem to decide what size or shape to make my ravioli/agnolotti/mezzalune! Despite the lack of symmetry, they tasted good, although I prefer my usual ricotta filling. Some time this month, I plan to invite my coworkers over for pizza, but 2 of them have Celiac, so I need to make gluten free dough. Mannaggia! My experience with gluten free dough is that it tastes like crap, with the consistency of styrofoam. Potato, rice and corn flour all result in a dense blob of yuck, yuck and yuck! Bleh! 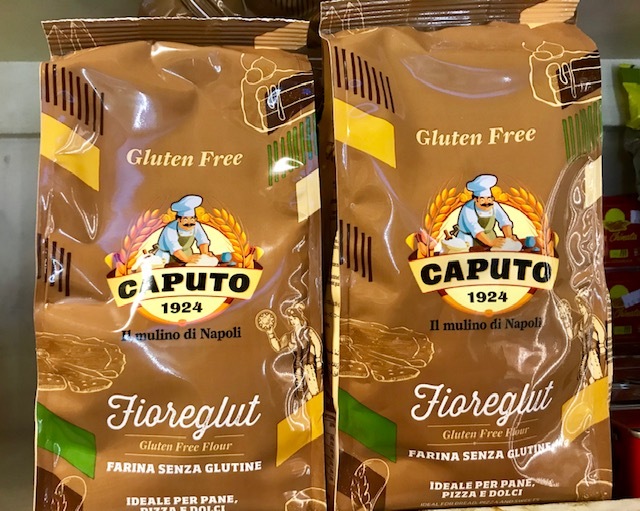 My local family run generi alimentari Renzullo’s finally started selling Caputo Fioreglut. This is a gluten free flour from Italia that I read about on both Paola‘s and Silvia‘s blogs. They are both in Australia and raved about it, but it was not available here. I bought a bag for $12.00 (!) and decided to try focaccia first. That way, if it came out as a sticky, unpalatable blob of yuck at least I did not waste ingredients on it. Fioreglut has some rice and corn flour, but the main ingredient is farina di grano saraceno-buckwheat flour! I followed the recipe on the bag, since it was almost the same as my usual recipe. Making gluten free dough is the opposite of making regular bread dough. Usually you want to knead the dough as much as you can to make it light and airy. Gluten free dough must be handled as little as possible to keep it together. My white blob of dough looked questionable, but it did rise. I dimpled it with my fingers and added rosemary, salt and parmigiano, made the sign of the cross and put it in the oven. I could not believe the results-it was actually delicious! Just look at the photo! 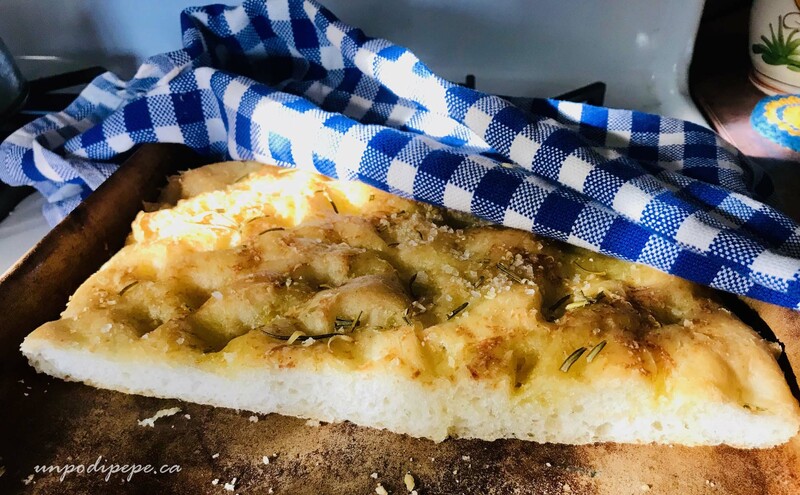 Before inviting my friends over, I will try focaccia Pugliese, then pizza.